We're coming up on one of the most magical times of year in our nation's capital - Cherry Blossom season! The National Park Service predicts peak bloom to occur between April 3rd - 6th this year, defined as the day when 70% of the Yoshino Cherry blossoms are open. The National Cherry Blossom Festival kicks off a couple of weeks prior; the Tidal Basin Welcome Area and ANA Performance Stage open on Saturday, March 23rd. Seeing these iconic blooms up close and against the backdrop of our national landmarks is truly a treat. However, getting to them and dealing with the crowds can be overwhelming for an adult, let alone with kids in tow! Whether you are local to D.C., or visiting from out of town, here are some tips that will make visiting the cherry blossoms with your kids more enjoyable. 1. Avoid Driving At All Costs. Seriously, don't do it. Not only is parking a nightmare anywhere near the Tidal Basin, you're also almost guaranteed to get stuck in gridlock traffic trying to navigate around the area. I found this out the hard way many years ago when I first moved to the area! Your best bet is to take the METRO. The Smithsonian station gets you closest to the Tidal Basin (10-15 minute walk), but is also mobbed during blossom time. If avoiding crowds is a priority, consider the Arlington Cemetery station on the Blue Line and enjoy a beautiful view while crossing the Potomac River on foot via the Memorial Bridge. Biking to the blossoms is another great option! This is best for families with older kids who can navigate confidently on their own, or conversely, for those whose kids are still little enough to ride in a carrier on a parent's bike. If you have older kids who can ride adult-size bikes, you can rent from Capital Bikeshare stations around D.C. or across the river in Arlington. You will have to drop your bikes before heading for the Tidal Basin though, as the crowds make it impossible to navigate around there on bikes. Take the water taxi! Park across the river in Old Town, Alexandria and take a 25-minute direct water taxi to the new Wharf development in D.C. It's a 10-minute walk from there to the Tidal Basin. The kids will love this one! 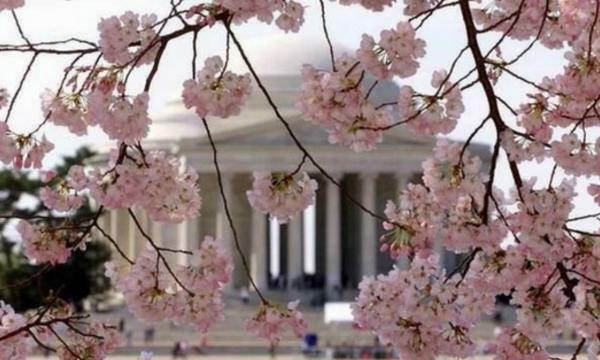 If you really want to drive, the National Cherry Blossom Festival has a partnership with SpotHero that allows you to reserve a spot in advance with rates up to 50% off drive-up. However, note that walking from some of these garages, especially with little ones, is quite a trek. Other free or low-cost parking options include the Hains Point lot (free, but fills up quickly) or across the Potomac River at Arlington National Cemetery, where you can park for $2/hour and walk across the Memorial Bridge to the Tidal Basin. 2. Come Early, And on a Weekday. If you can swing it, early weekday mornings are the best time to avoid big crowds, and capturing a sunrise shot of the blossoms is well worth the early wake-up call. Grab some pastries and coffee and head out early for a stunning breakfast along the water! 3. Expand Your Horizons. The most famous place for D.C. cherry blossom viewing is around the Tidal Basin. However, the crowds here can be overwhelming - literally shoulder-to-shoulder at times - making it an unpleasant experience and difficult to capture a photo (at least one that doesn't have other people in it!). There are many other locations around the city, or just outside, that offer lots of blooms with little crowds. The U.S. National Arboretum, a hidden gem located in northeast D.C. with plentiful free parking, boasts 446 acres of beautiful blooms and foliage, including a large collection of flowering cherry trees scattered throughout its expanse. There are several special events and exhibits in March centered around cherry blossoms, including a self-guided tour of their nearly forty different types of flowering cherries that you can drive, bike or walk to starting March 20th. Stop at the Visitor Center for a map. The 4.1-mile Hains Point Loop Trail, which surrounds East Potomac Park, is an awesome, less crowded spot to stroll or bike among the blossoms while taking in views of the Potomac and Anacostia Rivers and Washington Channel. Bring along a picnic lunch! Capitol Hill's Stanton Park, named for President Lincoln's Secretary of War, Edwin Stanton, features a small, but stunning Cherry tree-lined path and a playground for the kids to enjoy. The Japanese-style garden at Hillwood Estate in northwest Washington features a number of Japanese flowering cherry trees, as well as Japanese camelia, pieris, wisteria, and snowball viburnum which also bloom in the spring. Dumbarton Oaks, an historic estate in Georgetown, boasts a 10-acre garden with pathways lined with cherry trees. The garden opens for the season on March 15th. Please be sure to check their website for updates before visiting. Meadowlark Botanical Gardens in Vienna, VA features a collection of about 100 cherry blossom trees lining its lake and walking trails, as well as many other gorgeous spring blooms and a Korean Bell Garden. There is a small fee for admission, but parking is plentiful and free. Bethesda's Kenwood neighborhood is known for its cherry tree-lined streets - said to number 1,200 trees in all. Visiting can be a bit tricky, as there is no street parking allowed in Kenwood. The best suggestion we've seen for visiting is to walk or bike along the Capital Crescent Trail and exit the trail into the neighborhood at Dorset Avenue. 4. Take to the Water. If your heart is set on a Tidal Basin cherry blossom view, but not so much on getting suffocated by crowds in the process, take to the water! There are many options for viewing these iconic blooms and surrounding landmarks by boat. One of the most popular are the Tidal Basin paddle boats, which can be reserved ahead of time for cherry blossom season. For adventurous families with older kids, self-guided and guided kayak tours are available. For the less adventurous, there are many boat cruise options out there. Boomerang Boat Tour's Cherry Blossom cruise is one of our favorites. Save 50% off tickets with this CertifiKID deal. Another favorite is Capitol River Cruise Cherry Blossom Sightseeing Tour; save up to 29% with this CertifiKID offer. 5. Keep the Littlest Ones Safe. If you are heading for the Tidal Basin with toddlers in tow, keep in mind that most of the path around has no railing. Pushing a stroller is difficult during peak viewing times, so if your little one is still little enough to be in a child carrier, we highly recommend it. Not only is that the best way to keep them close and safe, it's also the best way not to lose them in the crowds! 6. Look Beyond the Blossoms. There are so many fun events and exhibitions of Japanese culture that accompany this national celebration. Be sure to check out the National Cherry Blossom Festival website for a complete calendar. The signature event is the National Cherry Blossom Festival Parade, which will take place on April 13th this year, a long-standing Washington tradition featuring lavish floats, giant helium balloons, marching bands, and family entertainment. Check out the Festival's Blossom Kids page for interactive games and presentations that teach kids all about the Festival and cherry blossoms. Check out the Best Things to See and do With Kids in Washington, D.C. This March for even more family-friendly fun in our nation's capital!